Back when I was a full-time teacher I taught in the Writing/Arts Lab Summer School program in our school district each summer. The first day of school was always filled with get-to-know you activities and stick journal making. It was always a favorite activity because it involved the outdoors, creating, lots of free choice, hole-punchers, and rubber bands. Stick journals are a fun tool to use to get kids writing and creating. We make them an open-ended project with no rules. 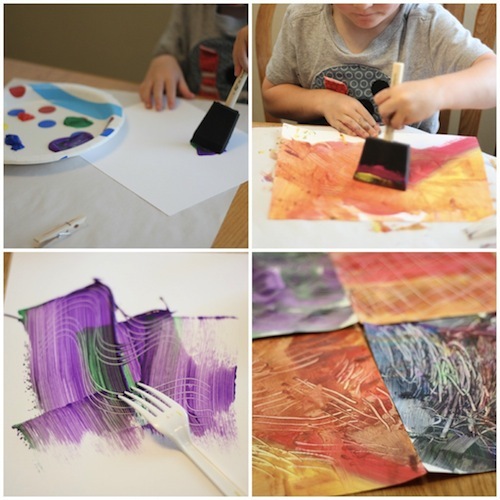 Today I’m going to share how we make our stick journals and then how we are using them to help us connect with family members this summer! variety of different types of papers- different textures, designs, colors, etc. Once we gathered all of the supplies, I set up a journal making station where they were all out on the table and accessible to my son. 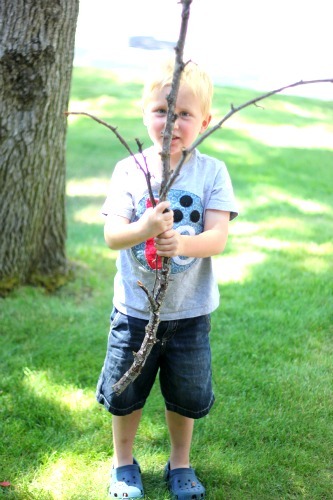 Then we headed outside on a stick hunt! After our stick hunt, we came inside to create our journal covers and then we assembled the journals. For our stick journal covers we made faux paste papers. Here’s a quick glance of what we did. 1. Line up all the papers (with your cover on top and cardboard on the bottom) so that one edge of the journal is straight and all the papers are lined up. 2. Take your double hole puncher and punch one side of the journal. 3. Feed a rubber band through both holes and then use them to secure your stick into place. Once your journal is assembled, you can open it up and start creating! Create a photo, writing, and drawing collection of some of our summer memories using our stick journal. We will then keep these summer memory journals in an easy-to-access place so that our kids can reflect on our trips, remember the fun they shared with family members, and practice retelling the adventures that we went on! This can be an open-ended activity. It doesn’t ever have to be finished because you can always add more paper, pictures, and creations! 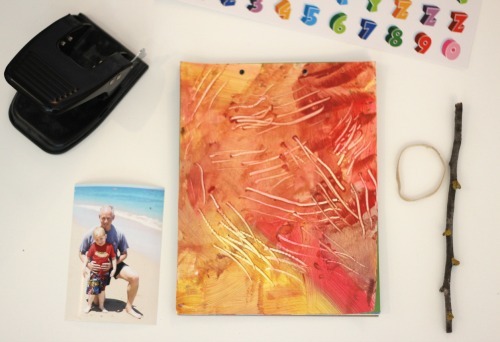 Use photographs and drawings to put together a special stick journal for a cousin. Include pictures from recent summer vacation adventures together, write notes, and draw pictures. Fill up a few pages and then mail the journal to a cousin and ask them to share their favorite pictures/memories from the summer too, and then mail it back. The journal can be passed along to several cousins or can just go back and forth between two kids. Pass the journal back and forth until it is completed or keep adding more pages until the rubber band can’t hold it together anymore! 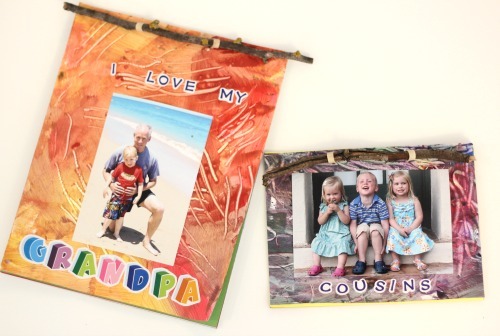 Make a special stick journal to let a grandparent know how much you love them. Include pictures of your child with their grandparents and have the child write (or dictate to you) special messages they want to share with their grandparents or special memories they’ve had. Make a grandparent pen pal journal for grandparents or other relatives you don’t see often or won’t see this summer. Have your child complete the journal cover and a create few pages filled with pictures and memories from the summer. Mail to a grandparent and encourage them to write a note to your child or send pictures of their own summer vacation. Mail back and forth as you go on adventures throughout the summer! 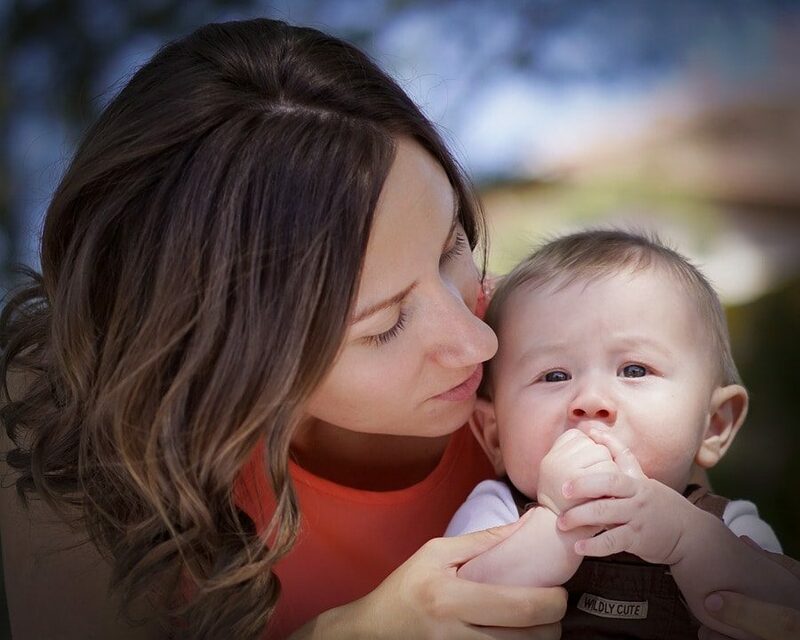 Ways to connect with your child when you are far away via Inner Child Fun. What are some ways that you connect with family members (near and far) during the summer? How do you document summer memories in your home?